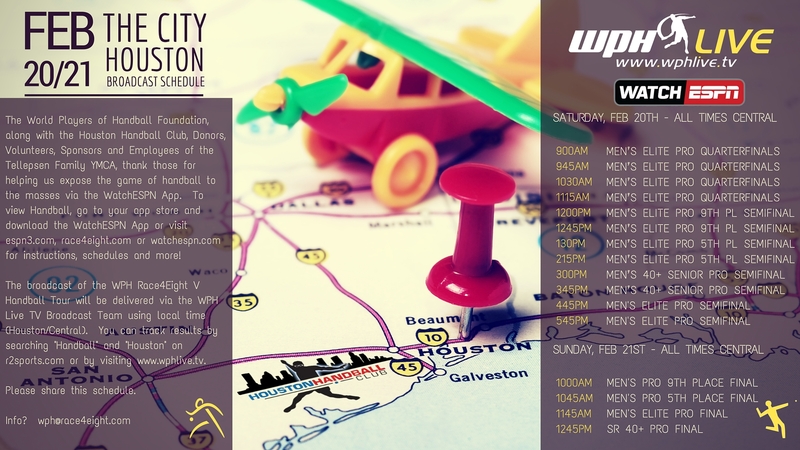 WPH R48Pro Houston Broadcast Schedule: ESPN This Weekend! WPH Race4Eight- Houston, Powered by ESPN3 & WatchESPN App, is this weekend! Paul Brady, Luis Moreno, Sean Lenning, Emmett Peixoto, Killian Carroll, Mando Ortiz, Dave Fink and Danny Cordova (true Elite Ranked Eight), plus Senior 40+ Touring Pros, Tyler Hamel, Marcos Chavez, Andy Schad, Dan Armijo, Dan Zimet and more, headline the Houston event. Top qualifiers are also on the bill (Allan Garner, Jon Iglesias, Luis Cordova, Anthony Selestow, et al)…. JR WPH will be in Houston w/pro player clinics, please email us for details. Deadline is today (Wednesday @ Noon) for the WPH Pro Stop and Texas State Doubles; however, ESPN/WPH Live TV already formulated the broadcast schedule for this Saturday and Sunday is here in PDF (Web Version, HERE). Please share with your handball lists and help expose the game of handball. WPH will be on ESPN Sat/Sun and only filming those two days. The full WPH Schedule to end the R48Pro season and this particular run with ESPN has additional info (Women’s Tour Resumes in New York next month; Seniors, Elite Men & Women in Portland). Cannot get ESPN & WatchESPN App? Blacked Out in your local area? WPH All Access Pass Holders have special viewing privileges. Contact us for details: Info@wphlive.tv.